« Are the U.S. Wars on the Middle East wrong because they cost so much? 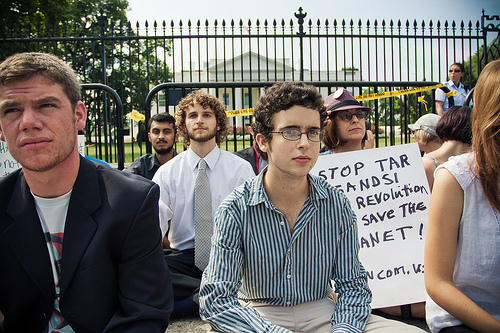 Last Friday, I joined 53 others in getting hand-cuffed by Park Police after we sat in front of the White House for a few minutes in protest of the Keystone oil pipeline proposed to run from Alberta Canada down to Texas refineries. Before Hurricane Irene hit North Carolina a day later, it was hot and still in Washington, and sweaty sitting on the pavement in front of the White House. I realized that most often it’s been cold or rainy when we stood or laid down there in protest against U.S. wars and torture. A young person was waving an American flag while sitting in. I’ve recoiled from American flag waving since at least 1967, when a college protester explained to my high school self that American flags wave over every aggressive war the U.S. pursues. You can call me an anti-flag waver, and I practice speaking up. I mentioned that the U.S. military is the single largest user of petroleum on the globe. Someone in the group answered, “but we have to keep our country safe,” and was met with groans by others, “as if” anything the U.S. military is doing now is keeping anyone safe. Almost everyone protesting the pipeline, I would guess, is against the aggressive military occupations and bombing — now of 6 countries. But I wonder how much people think about the relationship between the relentless destruction of the global environment by the carbon-based U.S. dominated world economy, and the U.S. military strategy to dominate the oil-rich areas of the globe. The empire is burning up tremendous amounts of oil to control the oil, mainly through control of refining, in order to get more oil. All of this takes a continually rising expenditure on “defense,” as the U.S. spends about as much on its military as all other countries, combined. The Obama administration on Friday removed a major roadblock to a planned $7 billion oil pipeline from western Canada to the Texas coast, saying in a report that the project is unlikely to cause significant environmental problems during construction or operation. Only a little over a year ago, much of the world was genuinely alarmed at the BP oil disaster in the Gulf, and for a time, Barack Obama put a moratorium on deep oil drilling in the Gulf. Despite clear and persistent evidence that BP and other oil companies could not avoid such disaster, and that the damage is “far from over,” according to a report by the National Wildlife Federation in April, 2011, the ban has since been rescinded. the federal government struggled for five disastrous months to contain the much larger BP blowout in the Gulf of Mexico. Now imagine the increased danger and difficulty of trying to cope with a similar debacle off Alaska’s northern coast, where waters are sealed by pack ice for eight months of each year, gales roil fog-shrouded seas with waves up to 20 feet high and the temperature, combined with the wind chill, feels like 10 degrees below zero by late September. I was surprised to find out, recently, that the Alberta tar sands oil extraction is, according to Andrew Nikiforuk, author of Tar Sands: Dirty Oil and the Future of a Continent, the “world’s largest energy project, the world’s largest construction project and the world’s largest capital project.” Nikiforuk says bitumen, the form of oil in the tar sands, requires 3 barrels of water to produce one barrel, which then has to be further refined. Canada is already sending one million barrels per day to the United States. 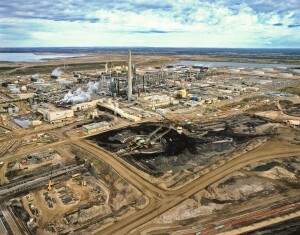 The oil sands have emerged as Canada’s fastest-growing source of greenhouse gas pollution. 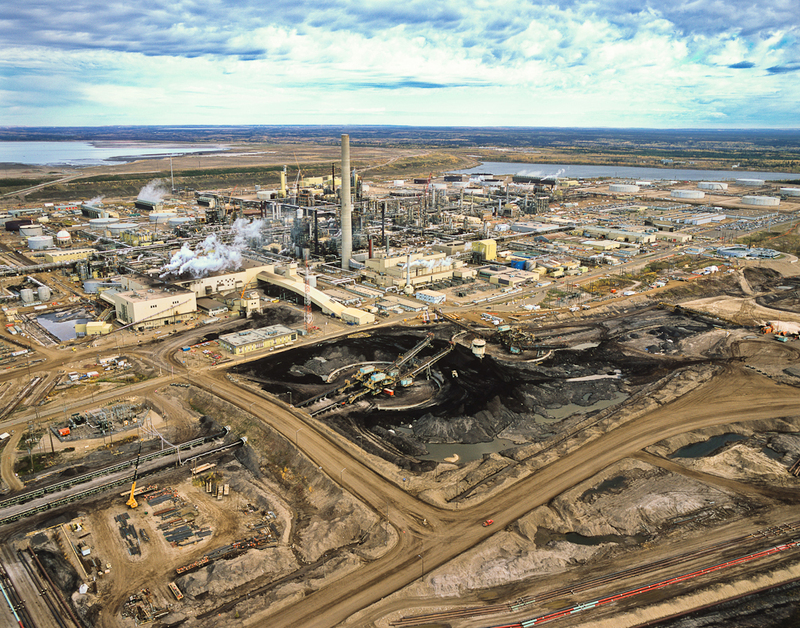 Other impacts — from drawing down the Athabasca River to the creation of toxic tailings dumps, to hundreds of square kilometers of strip-mining and drilling in the boreal forest — are growing just as rapidly. I know this. If hundreds or thousands of people get to Washington D.C. this week to join the White House protests, many more people will know about the outrage of the destruction of Canada to supply dangerous, dirty oil to the U.S. war machine. I hope you will be one of them! 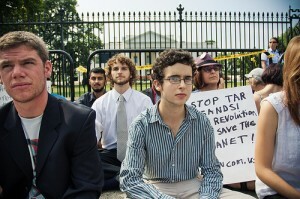 Go to TarSandsAction.org. This entry was posted on August 28, 2011, 10:48 pm and is filed under environment. You can follow any responses to this entry through RSS 2.0. You can leave a response, or trackback from your own site. I don’.t want the repulsive party and it’s corporate allies to poison the environment for my family. The pipe line is a symbol of corporate and republican worship at the altars. Of death, destruction, deception and greed. These types should be forced to clean up oil spills by eating the spillage.